One year has passed since our family bee-keeping business, Guslice & Melnice honey, received a Rewilding Europe Capital (REC) loan. This loan was used to purchase new equipment, beekeeping containers, a device for collecting bee venom and for increasing our number of beehives. Continuing the family business with the support of Rewilding Europe turned out to be very important for us. We are both proud to be connected with this initiative and enthusiastic about the future and further development of our business. Ines and Sanjin Žarković presenting their family owned business and products in Velebit Mountain rewilding area, Croatia. After we bought all the necessary equipment and new hives, we encountered several obstacles on our way. The venom collectors did not fit on our hives and we needed to adjust them. The adaptation process was extremely difficult because our hives were ‘alive’ with bees living inside. Nevertheless, we managed to complete all the required adjustments. We worked day and night to succeed and achieve our plans. To find out if the venom collectors would work, we went through a successful test phase and have decided to start with the venom production next season. 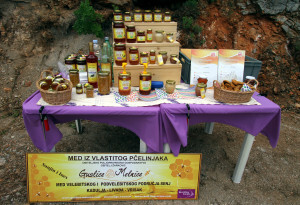 Due to the REC loan provided to Guslice & Melnice we developed infrastructure, expanded our product line, developed several types and sizes of packaging with Rewilding Europe’s logo on the label, and are now also set to start the production of raw propolis (bee glue) and higher quantities of bee venom. Rewilding Europe’s logo on all our product labels and promotional materials is in itself attracting customers and improving our sales. It also creates curiosity about Rewilding Europe and our story that we are more than happy to communicate. Guslice & Melnice honey products in Velebit Mountain rewilding area, Croatia. Our main products are regular and sage honey but we also produce cream honey with chocolate, cinnamon and with different types of nuts to expand our product line. The sage grows in meadows in the heart of the northern Velebit, where some of our hives are located. The honey is of rich golden colour and it gets its rich aroma from wild mountain herbs that give the Velebit honey a very special taste. It is extremely important for us to preserve these natural areas and beautiful landscapes. Sanjin has realised this and as President of the local Senj Beekeeping Association has attracted beekeepers from all across the area to work together towards the common goal of nature protection and ecosystem sustainability. We realise that the bees, which are threatened by factors such as pesticides and pollutants, may not survive without our support. Although the past year (2014) was exceptionally bad for beekeepers in Croatia due to frequent rain and wind, we were very happy with our returns. It was the first year in which we achieved our targeted high honey yield, together with expanding our business and product marketing. Throughout the year we presented our products at many national and local fairs such as the 13th Honey Days in Zagreb and the Senj Fair. We are delighted with the outcomes given that we shared experiences with other honey producers, promoted our brand and gained loyal customers that now regularly buy our honey as they recognise the quality of our products and the positive approach to nature that we use in producing them. 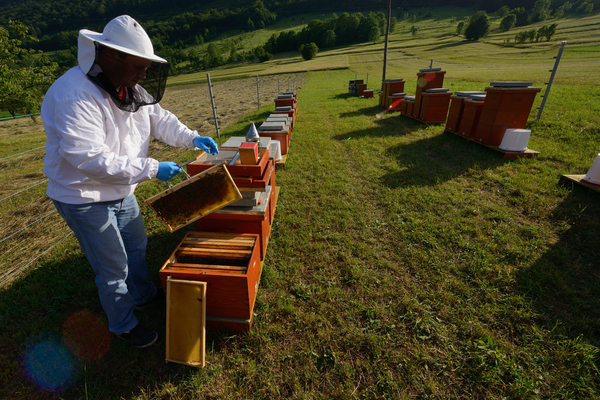 Bee keeper Sanjin Zarkovic at his bee farm in Melnice, Velebit Mountain rewilding area, Croatia. Unfortunately last year was marked by a very sad event, in particularly for me personally. While we were out on the pasture meadows on Velebit, a bee stung me and I fell into an anaphylactic shock. I was stung many times before but surprisingly this time I reacted badly. After that day, I can no longer visit the beehives with my husband so my father took over the role of Sanjin’s assistant. We found a doctor who is trying to cure my allergy and we hope it will succeed. After this event, we have divided the workload – my husband works in the apiary and cares for the bees, and I take care of packaging, sales and marketing. Now at the start of the new season, we anticipate and hope for even better yields of honey and we also started with the collection of bee venom, which is more and more used in the beauty industry. The venom yield per day is very small and to collect a representative quantity we need to work hard over the whole season. In addition to honey and venom we are also set to collect, package and sell pollen and propolis. Our goal is to produce more products that are more resilient to the weather conditions and especially the bora (an extremely strong wind typical for our area) that impacts our main sage pasture yields. This will create security for our business if honey production falls short. We cannot influence the weather but adjust and be flexible and continue with nature. Maybe some people think we exaggerate in our passion and work, but we just want to give the best of ourselves for something we truly love and also give our personal contribution to rewilding of “our mountain”. Each new problem or adversity that appears gives us even more strengthens to try harder and go further. Each year we are getting better results and business is growing. The best indicator that Sanjin has a good technique and way of beekeeping is the admiration and acknowledgement he is getting from the Croatian beekeeping community. For more information see our web page http://www.zarkovic.info/ and check out the honey products. If you would like to try them and place an order, contact us by email at dvorac@gs.t-com.hr. Linden Tree Retreat & Ranch – Escape, Relax, Unwind!